If you find yourself reading this profile you may be struggling to cope with some of life's challenges. Making the initial contact is often the most daunting step as it's often not easy to open up to a complete stranger so I encourage you to call me now regarding any difficulties you may have. You have nothing to lose and the first session lasts up to 1 1/2 hours which costs the same as a normal 1 hour session so that you can come and tell me about yourself and see if we both feel comfortable about working together. We can then set up further sessions on a weekly basis either short term or open-ended. Skpye sessions can also be arranged when necessary if you are unable to attend a face to face session. I really look forward to hearing from you by phone or text message on 07904 685282 or email alexispfeiffer@btinternet.com I will be very happy to answer any queries you may have about the way I work. 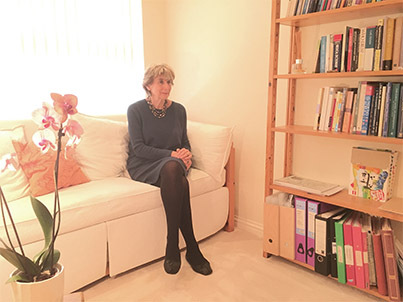 I offer consultations in a quiet, private and comfortable therapy room in Mill Hill which is easily accessible by bus, tube or Thameslink overground and there are no parking restrictions. Individuals £60 for a one hour session. Couples £75.00 for a one hour session. I can offer a limited number of concessionary rates depending on personal circumstances. This can be discussed during the first session.